Tori Teel (l) and Addison Combs (r) with Civitan Nathan Waters. 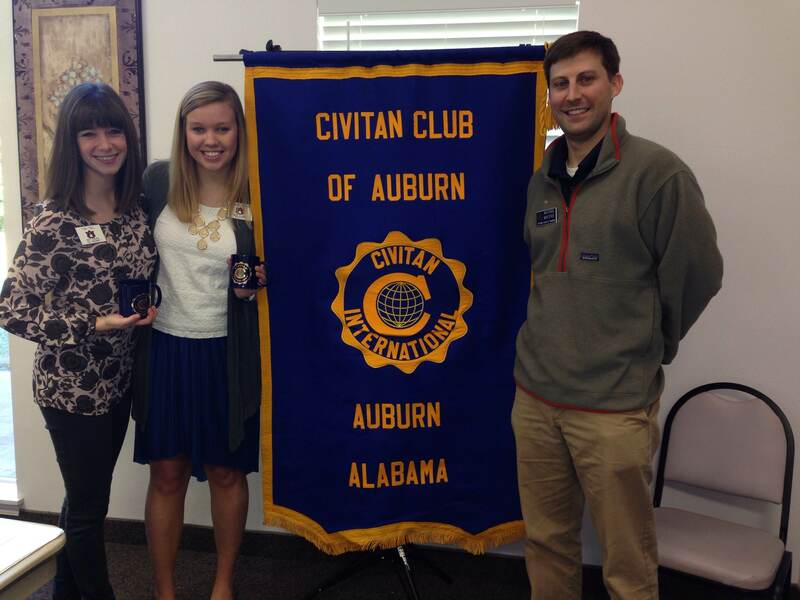 Best Buddies of Auburn University was the subject of the program at Auburn Civitan Club on November 7, 2014. Best Buddies is a nonprofit organization dedicated to establishing a global volunteer movement that creates opportunities for one-on-one friendships, integrated employment and leader development for people with intellectual and developmental disabilities. Two Auburn University students, Tori Teel and Addison Combs, both of whose majors concern working with people with disabilities and who are officers of the local chapter, presented the program. In the picture above Tori Teel is on the left, Addison Combs next, and – on the other side of the banner – Nathan Waters, Civitan member who introduced them. Best Buddies is a vibrant, international organization that has grown from one original chapter to almost 1,700 middle school, high school, and college chapters worldwide, participating in each of the 50 United States and in 50 countries around the world. This entry was posted in Programs and tagged Auburn University, Best Buddies on November 14, 2014 by kviversen.